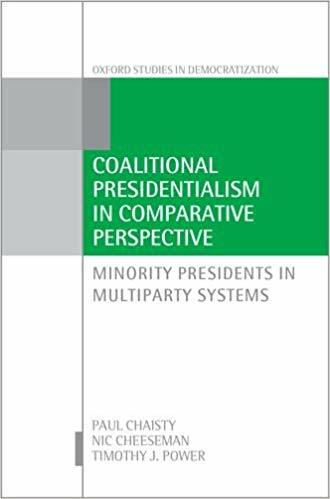 The first cross-regional study of how presidents form and manage coalition governments is to be published in book form on 1 March, following a pioneering collaboration between academics from three OSGA centres. Coalitional Presidentialism in Comparative Perspective: Minority Presidents in Multiparty Systems (Oxford University Press) has been written by Paul Chaisty, Associate Professor in Russian Government, Timothy Power, Director of the Brazilian Studies Programme and Professor of Latin American Politics, and Nic Cheeseman, formerly Associate Professor of African Politics at OSGA and now Professor of Democracy and International Development at the University of Birmingham. Most existing literature is based on understanding a basic two-party system, he adds, but in newer democracies there’s often even as many as thirty different parties, so the probability that an emerging president won’t have a majority is high. He or she has to form a coalition and act more like a Prime Minister. In practice, multiparty presidentialism has proved surprisingly sustainable – so how is this happening? With funding from the ESRC, the CPP sought to investigate and compare how minority presidents built multi-party coalitions to manage their legislative agenda in nine emerging democracies between 1979 and 2014: in Africa (Benin, Kenya, Malawi), Latin America (Brazil, Chile, Ecuador) and the former Soviet Union (Armenia, Russia, Ukraine). A £730,000 grant enabled the researchers to appoint Svitlana Chernykh as their postdoctoral research officer and employ nine researchers (one in each capital city) to carry out interviews, collect data and produce case studies. All the data collected, including more than 350 interview transcripts, have been archived and are available online. As well as providing high-level research training for the local researchers recruited, this pioneering project is leaving a legacy of information for future investigations in this important new field.